Top-Rated SellerFrogAndBearCreations consistently earns high ratings from buyers thanks to fast shipping and excellent service. I will REPAIR any of MY JEWELRY items that ARRIVE DEFECTIVE. About the Problem and RETURN the item for REPAIR. 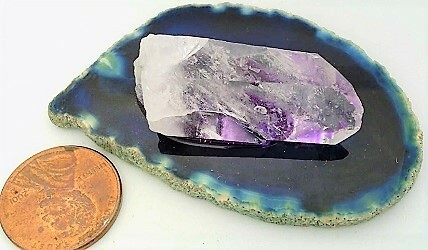 Quartz crystal set in resin on a dyed Brazillian agate slab Can be decorative or for an altar piece Thanks for browsing my item PROBLEMS WITH CHECKING OUT? - PLEASE MESSAGE ME!